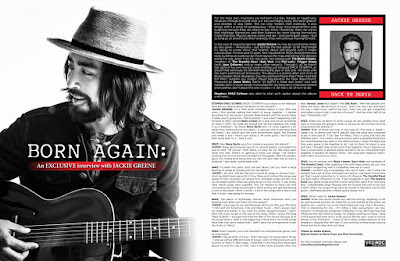 Discussions Magazine Music Blog: JACKIE GREENE: An EXCLUSIVE interview! JACKIE GREENE: An EXCLUSIVE interview! For the most part, musicians are not born in a box, literally or figuratively. However, through trial and error (i.e. hits and flops), many find their ‘groove’ and attempt to stay there. This not only hinders their creativity, it also brings with it a sense of complacency – they never move beyond their core audience because they are afraid to lose them. Thankfully, there are artists that challenge themselves and their listeners by never placing themselves inside that box. Musical genres come and go – and come back again – but as long as an artist trusts their instincts, they will continue moving forward. 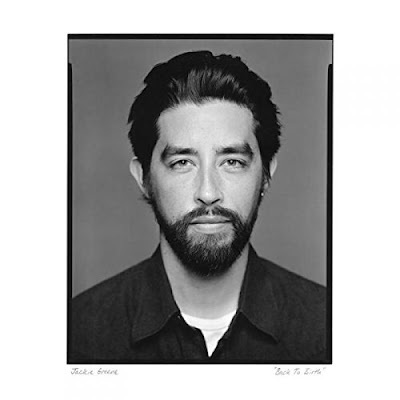 In the case of singer/songwriter Jackie Greene, he may be classified by many as one genre – Americana – but he’ll be the last person to let that hinder his ability to create music that reaches above and beyond such a simple classification. For the past 13 years, he’s travelled the Roots Rock/Americana road, building an audience by throwing out the map and taking little detours along the way. Apart from his solo work, he’s played with The Black Crowes, members of The Grateful Dead (Bob Weir and Phil Lesh), Trigger Hippy (with Joan Osborne) and so many other projects. Through it all, he hasn’t lost sight of his own musical vision and has just released Back To Birth, an album that continues his trend of mixing the joys of ‘60s and ‘70s Rock with the warm earthiness of Americana. The album is a diverse affair with hints of Blues, Gospel, Rock, Bluegrass, Country and even Power Pop (“Now I Can See For Miles” outdoes any modern Power Pop band in the hook department). Produced by Steve Berlin, Back To Birth is filled with heart, soul and melodic bliss. It never stands in one place for too long yet it is focused, honest and carefree. Don’t place this one in a box – it still has a lot of livin’ to do! STEPHEN SPAZ SCHNEE: Back To Birth is just about to be released. How are you feeling about the album at the moment? JACKIE GREENE: I’m a little more confident about it now. 2012 was when I first started putting that batch of songs together – I started recording it at my house. I became disenchanted with the whole thing. It really wasn’t going how I had expected. It just wasn’t happening. Fast forward to 2013, I joined Black Crowes for a year and put all recordings on hold. In 2014, we made the record that we are releasing. We made it up in Portland – my friend Steve Berlin and I. It came together a lot easier than working at my own place – it was just nice to get away from my home. I put myself into the work environment again. We finished and mixed it and I wasn’t sure about it. At some point, I let it be and then came back to it. I love it now. SPAZ: Was Steve Berlin your first choice to produce this album? JACKIE: Steve has produced two of my records before. I just asked him and he said, “Of course.” With Steve, it’s easy for me. We know each other very well. There’s no ‘getting to know you’ phase – we weren’t wasting a lot of time and went straight for the jugular. With this project, given the limited time frame that we had, the best idea was to have a producer I was really comfortable with. SPAZ: It’s been five years since the last album. Did you have a large backlog of songs to choose from for the album? JACKIE: I did and I still do. We had a bunch of songs to choose from – what we didn’t have was a lot of time. Steve and I picked the songs way ahead of time. Normally, we record 15 or whatever songs but this time we recorded exactly what was going to go on this record. It was pretty clear which songs went together. And we needed to have cats that were pretty well-rehearsed and get in there and try and get that feeling in one or two takes. I think it works – a lot of the songs aren’t ‘fancy’ and that is what I was going for anyway. SPAZ: The album is stylistically diverse. What influences were you drawing from when you went into this project? JACKIE: I went back to my old influences which are ‘60s and ‘70s Rock ‘n’ Roll and old Americana, Folk and Blues music – that’s always been my bread and butter. In my mind it’s pretty straight-forward. I didn’t want the music to get in the way of the song. When I wrote the song “Back to Birth,” I thought that’d be the title of the record because all of the songs have a ‘back to the beginning’ theme and a lot of the songs have lines that point toward that. I didn’t want the arrangements to get too tricky or ‘fancy’. SPAZ: Does it bother you to be classified into one particular genre, such as Americana? SPAZ: When you sit down to write a song, do you already know what style of song you are going to write, or do you let the moment and the song dictate the direction? JACKIE: Both of those are true. In the case of “The King Is Dead,” I made a lot of demos and had a specific way that song was supposed to be. In the case of “I Can See For Miles,” that’s a song that had two different parts – the chorus and pre-chorus were a separate thing from the verse because they were in two different keys. I wasn’t thinking that they were going to be together at all. I sat on them for about a year and then I thought they would kind of go together. Once I figured out how it would work, it seemed pretty natural to me so I smooshed them together. It became an organic thing – the song took shape by itself. I didn’t labor around it as much. SPAZ: You’ve worked with Black Crowes, Gov’t Mule and members of The Grateful Dead. After spending time with these artists, do you now approach songwriting with a completely new set of rules? JACKIE: I wouldn’t say a completely new set of rules. I don’t think I’ve actually had a set of rules, although I’ve tried to. I just haven’t found any yet that I would subscribe to. In terms of influence, The Grateful Dead has been highly influential on me. Their songbook is vast. The Grateful Dead have great songs and that is what sets them apart from everyone else – unbelievable songs. Playing with the Crowes was a lot of fun, but it didn’t affect my songwriting, because my job in that band was to play guitar. I definitely became a better guitar player for it. SPAZ: What’s next for Jackie Greene? JACKIE: When the record comes out, we’ll be touring. Hopefully, it will be well-received and we can make the rounds and do all the shows we need to do. I used to live on the West Coast and now I live in Brooklyn. That is interesting for me – I’m riding a bike everywhere I go now. (laughs) I’m being fully immersed in Brooklyn living. We’ll see how that influences the next batch of songs. I’m already working on those. I have a little apartment here and it is set up just like the way I used to record demos in San Francisco – I have to do it really quietly because of the neighbors. (laughs) But we’ll see. I’ll just continue writing songs, playing shows and try to stay alive out there.